If you live in Vienna, West Virginia, Preston’s Beauty Academy provides students with an incredible opportunity to spark a new career. Our academy offers classes for whichever career path you wish to take: hair stylist, esthetician, massage therapist, or a combination of these skills. The classes at our academy can help turn your passions into a thriving career. You will only need to travel a few miles from Vienna to our Preston’s Beauty Academy in the Mid-Ohio Valley. Students, locals, and tourists will find that we have more than enough to offer when it comes to beauty services. People come to the Academy from all over the state. 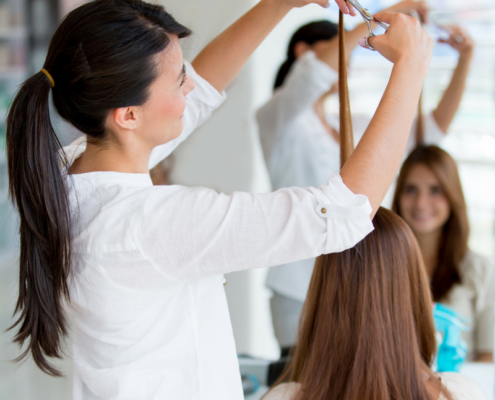 If you attend our academy, you will get more than just a beauty education. You will also be able to hone your practical skills using our clinical services. This will help you prepare for branching out on your own when you decide to take your career to the next level. Anyone who earns their license through our beauty academy can practice in Ohio or West Virginia as our academy offers licenses in both states. The licenses are separate, so be sure to apply for the license that covers the state in which you’d like to practice. This includes nail services, massages, facials, and hairstyling. We can accommodate almost every request from our clients because we provide traditional and cutting-edge services. Build a Career: If you are looking to become independent in your career we offer a great place to build a career after graduation. Affordability: You will find that our tuition rates are much more affordable than a traditional college or university. Our Clients Love Us: One of the advantages of learning at Preston’s is building relationships with our customers. They know you are learning new skills, and they are happy for the discounted prices that come along with that. You will find that the people in the Mid-Ohio Valley are warm and friendly. Accessibility: Our academy is a short drive from just about anywhere in the Ohio Valley. Say goodbye to the long commute to your current job and come join us. Your career will thank you. New Challenges: A midlife crisis can be overwhelming. Maybe you want to take on a new challenge? You can learn how to make others feel better about themselves by attending our academy. Be sure to apply for a spot at Preston’s Beauty Academy, LLC if you are ready to begin a new career. The goal of our academy is to help you succeed as much as possible. We have a long history of helping students get started towards building a long and successful career in the beauty services industry. You can research the opportunities available to you at our academy online or you can call 740-374-5434 to begin the application process. You won’t be disappointed with all we have to offer. We are also happy to provide prospective students a free walk-through of our academy simply by calling the number above or completing the contact form on our website.